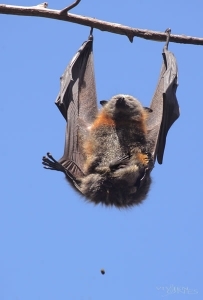 Ku-ring-gai Bat Conservation Society Inc.
1985 – Ku-ring-gai Bat Colony Committee (KBCC) was formed to protect the flying-fox maternity camp at Gordon, on Sydney’s north shore. A proposed housing development threatened loss of habitat. The land was purchased jointly by NSW Government and Ku-ring-gai Municipal Council on advice from the Heritage Council. 1986 – KBCC commenced production of its quarterly newsletter, Friends of Bats. Newsletter archive contains the first three editions and more recents issues. 1987 – KBCC was incorporated under the NSW Incorporated Associations Act. The habitat restoration project in Ku-ring-gai Flying-fox Reserve commenced, with approval of Ku-ring-gai Council. Read more about this project. 1998 – KBCC was reconstituted as Ku-ring-gai Bat Conservation Society (KBCS) Inc. as an association with a general membership and an elected committee which necessitated the name change. This enabled KBCS to set up its Bat Conservation Gift Fund. The website www.sydneybats.org.au was launched. Protecting and restoring habitat in Ku-ring-gai Flying-fox Reserve, jointly with Ku-ring-gai Council. KBCS holds its annual general meeting in August or September each year. Our management committee meets monthly. Members wishing to participate more in our activities by joining the committee or helping out with particular projects are most welcome.